Monday night saw the temperatures dropping to nearly zero but hey we decided to crack on with a Muskets & Tomahawks game in the Shed. Fortunately the Shed is insulated and a small heater did its best to pump up the temperature inside to a barmy 13 degrees. This bodes well for games as we hit the depths of winter! 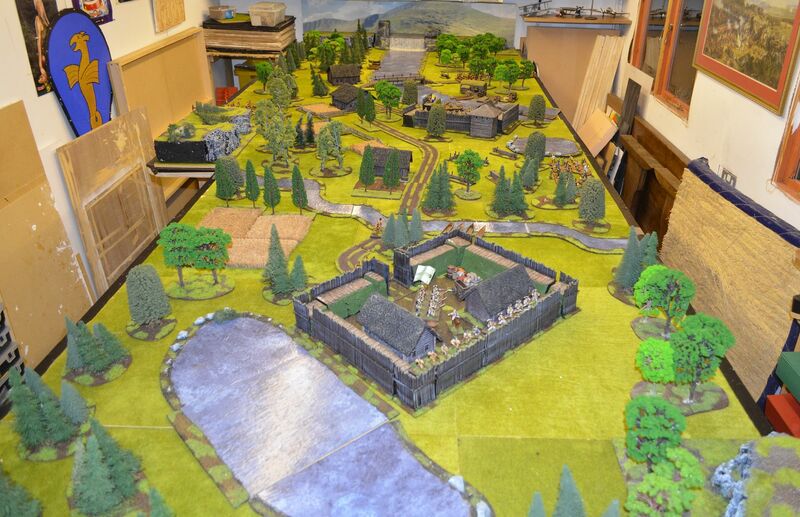 Following the previous weeks VBCW game my new players were keen to have a crack at M&T and judging by their reactions when they saw the table I'd like to think they were more than happy with this choice. I had expected six players (including myself) but sadly two had to withdraw at the last minute. Not to worry I made some minor alterations to the scenario and things planned out well. First up a quick description of the table. 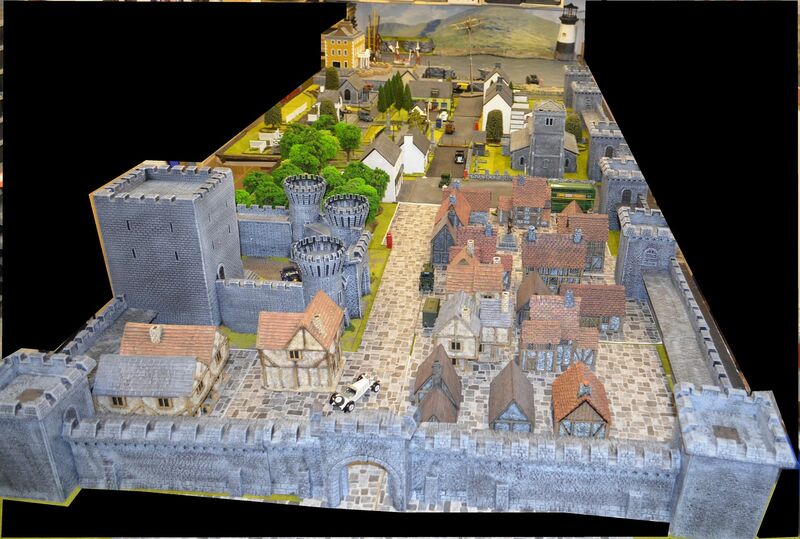 This featured a shed load of trees, all my log houses (Pegasus) and my scratchbuilt fort. This was used to build both a fort and trading post. 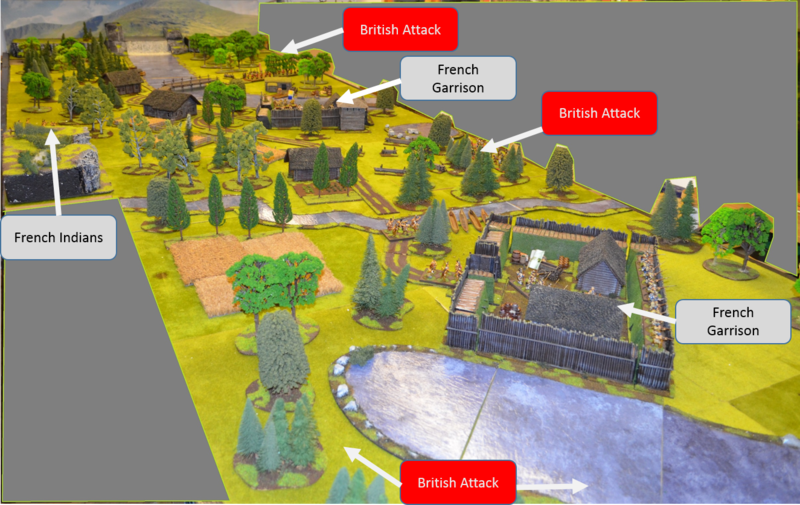 Both of the two fortified areas were defended by French Woodsmen and regular troops. 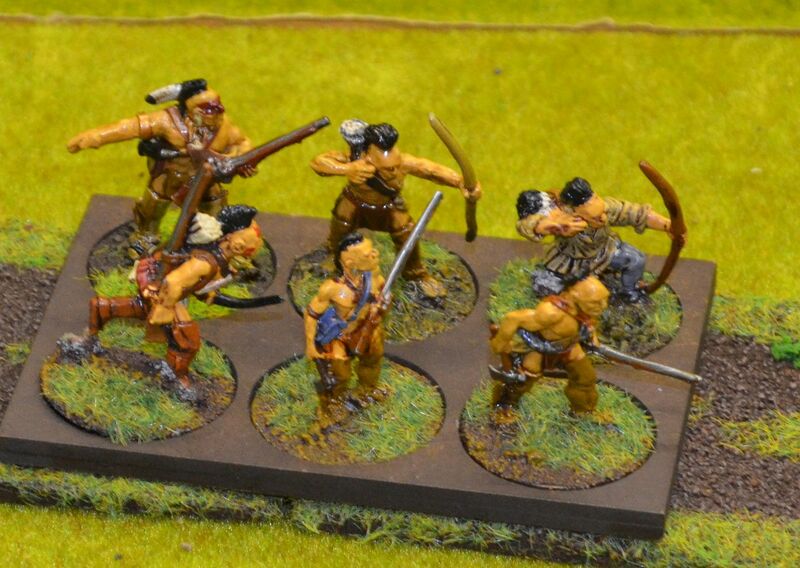 Native allies (originally to be played by one of the missing players) were now fed into the game as reinforcements. You can see from the positions marked out on the map the French Garrisons were quite close to the British lines. 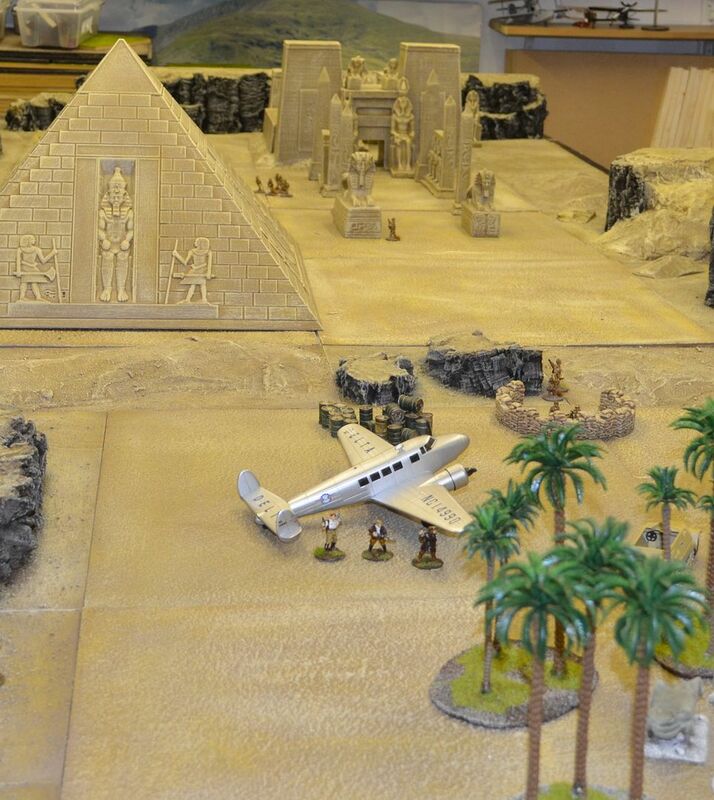 This had the impact of accelerating play and getting stuck into the action. The following pictures are screenshots from the battle. 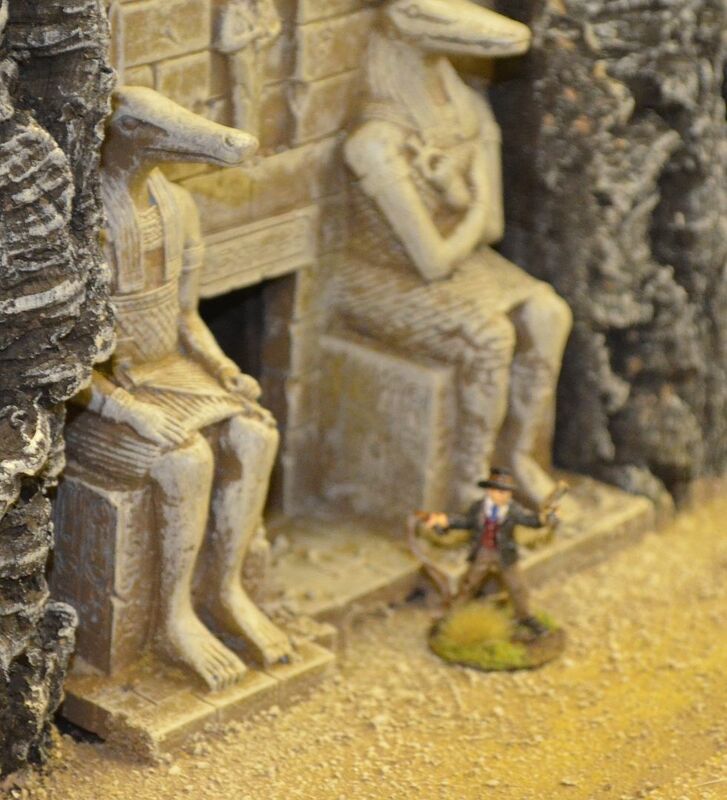 Unfortunately I wasn't able to take as many photos as I would have liked...I was playing. 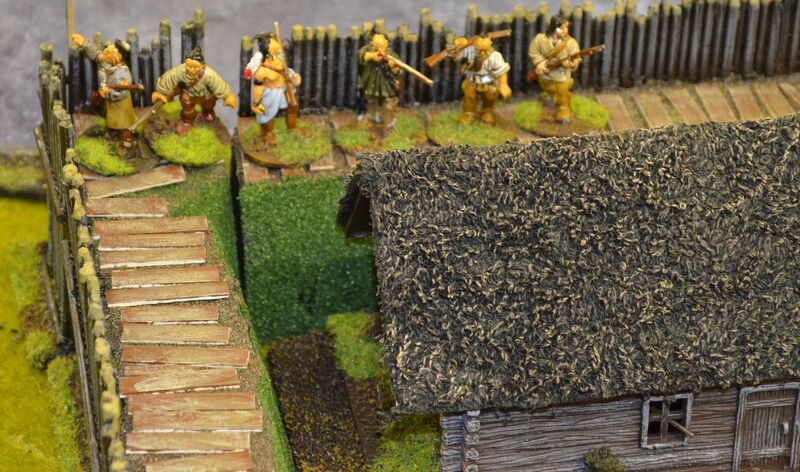 Redcoats crossing upstream and came under furious fire from the Canadian irregulars. 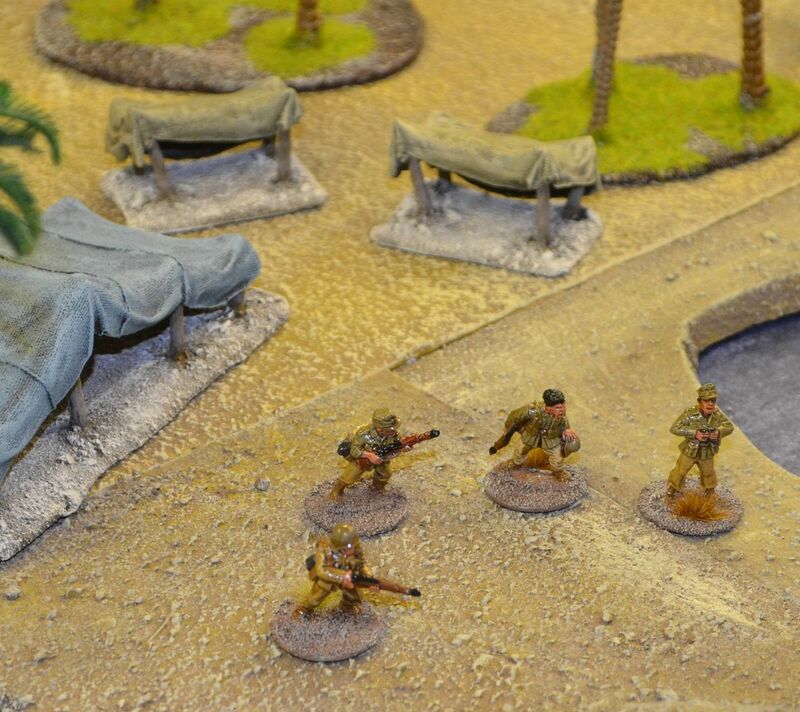 All three platoons suffered and could not press home the advantage. 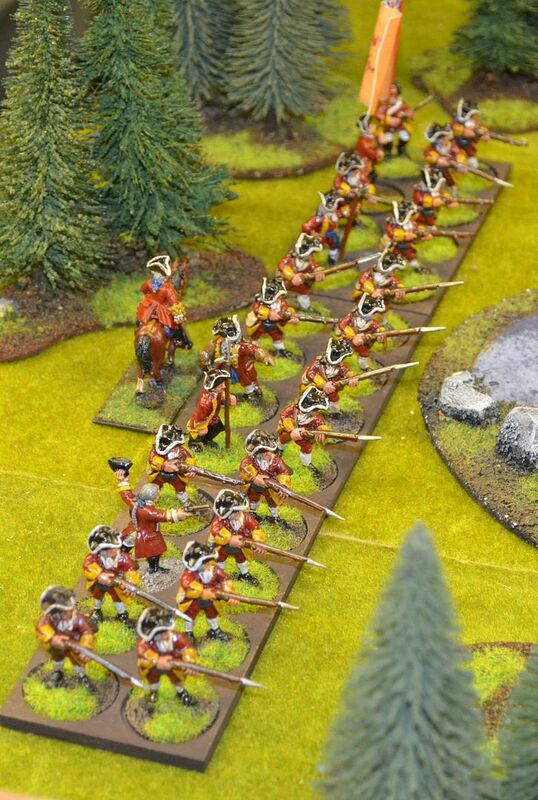 Despite carrying bows all Indians were musket armed..
Having crossed the bridge on the right flank the British redcoats came under sustained Indian and Canadian irregular fire and just couldn't push forward to towards the trading post. 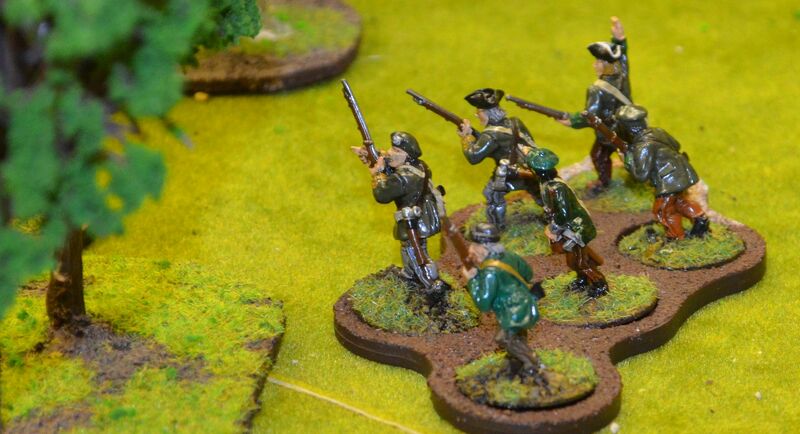 The Rifle armed Rangers sniped across the expanse of the river but slow loading and well defended opposition meant most shots fell short of their mark. 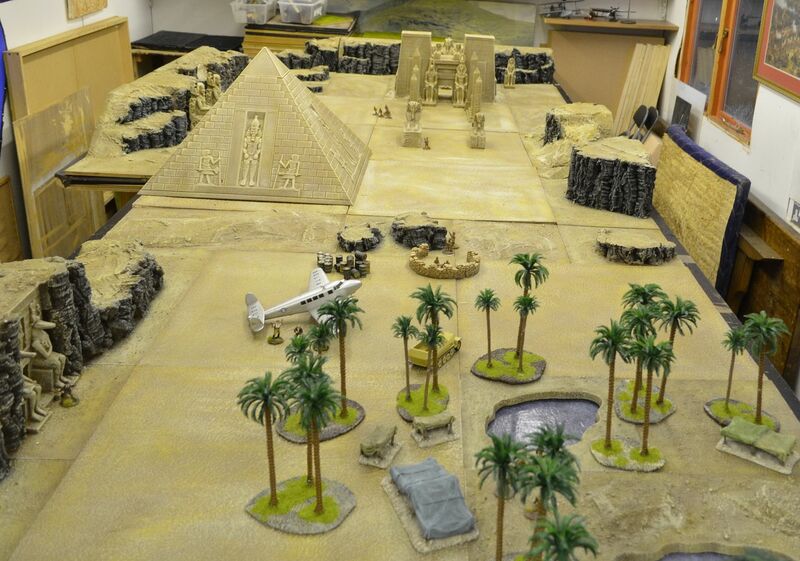 Five months later I am delighted to report that the desert boards, Egyptian monuments, temple, pyramid and now Oasis are complete. 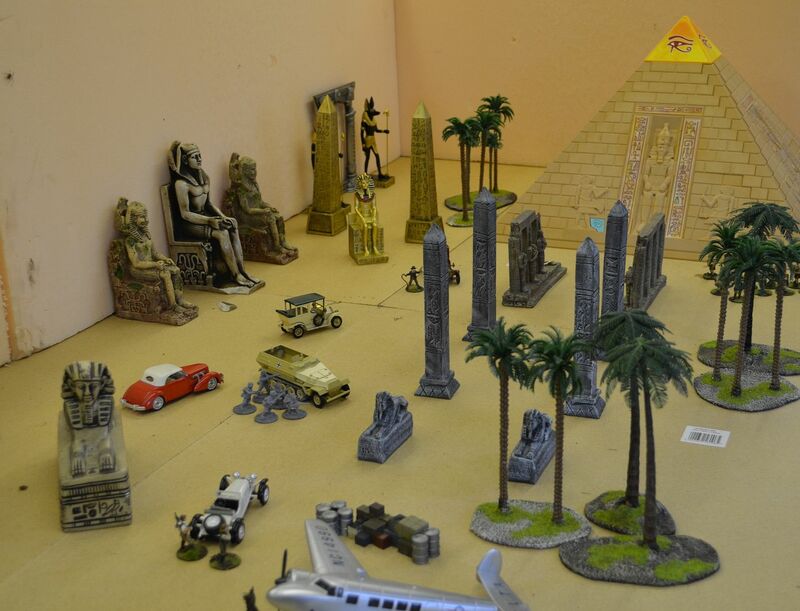 There are clearly some more bits and pieces to add for a number of other genres - eg Middle East town, river Nile etc but I can now at least think about putting together some pulp games. 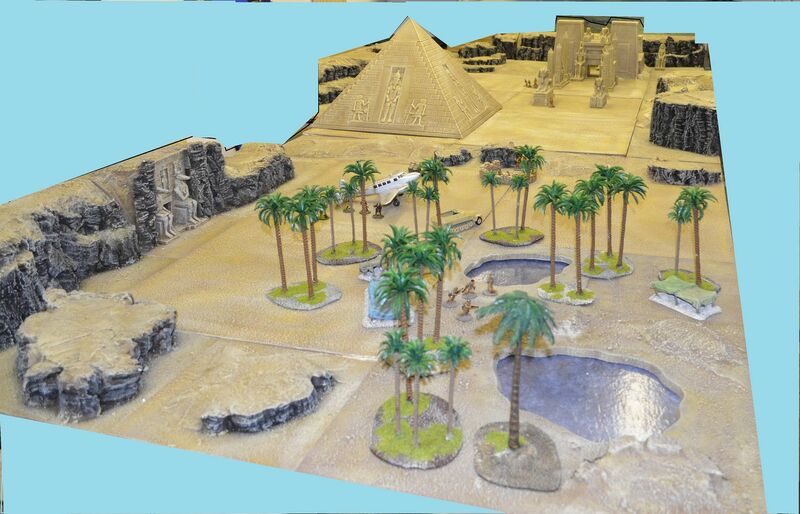 The oasis is just a couple of mdf boards cut out with blue floor tiles stuck on the underside to create the water. The Palm trees were predominantly sourced from a Chinese ebay seller. I bought these a couple of years back for my pirate games. 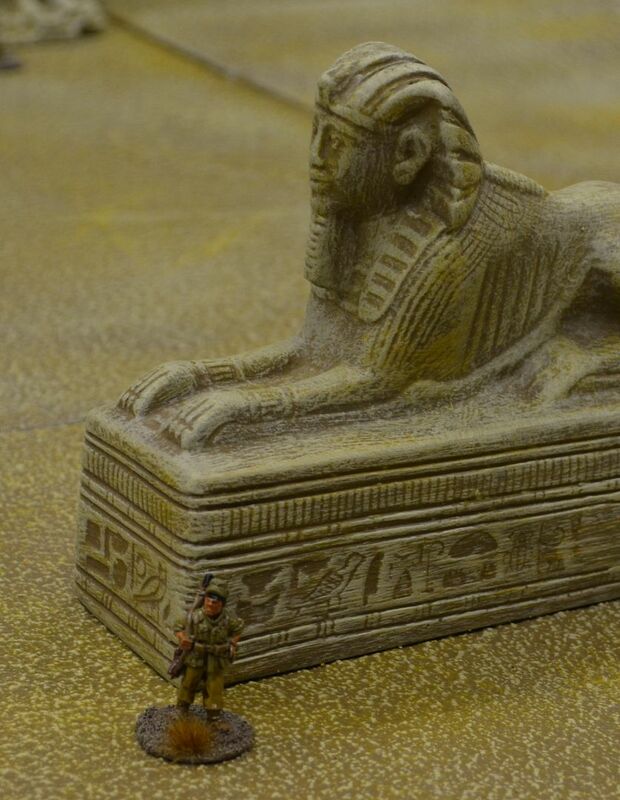 The Afrika Korps figures are mostly Black Tree and Artizan Designs - I painted up about 40 of the guys before I got bored. Only another 15 to go.. Played around with Paint for the last photo to see if cutting out the background helped with the picture...not too sure. 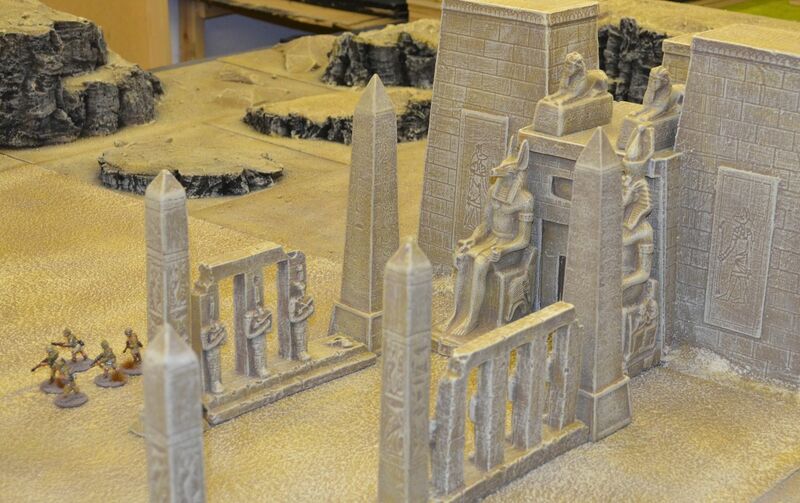 They are all bought and 50% are based, primed and have some paint on them already. 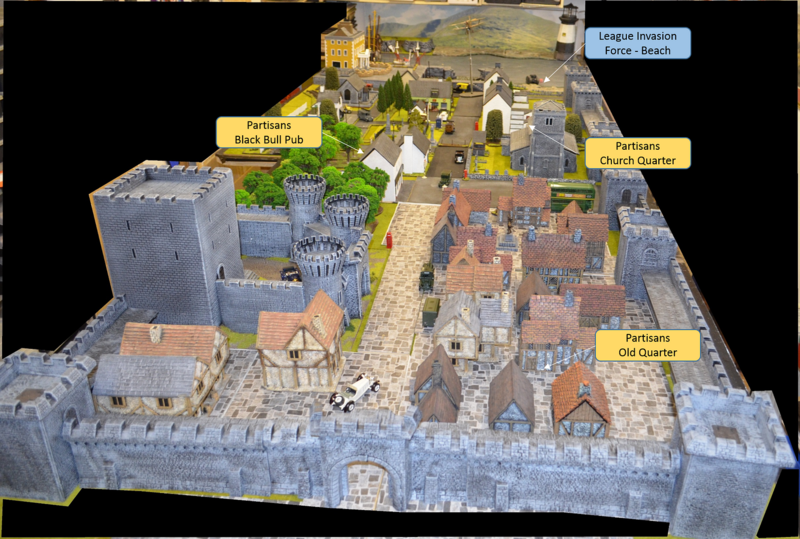 The small walled city of Southchester (ficticious) lies on the Essex side of the River Thames. Its about 40 miles from London. Prior to the War this estuary town was famous for its local eel fishing, a rather beautiful 14th century church and the near perfect Norman Keep. Local travellers would often stay in the King George Hotel situated on the harbour front. For the last six months it has been under the protectorate of the BUF. The local garrison commanded by Colonel Steven 'the Lash' Gates, a rather unsavoury character who bears no resemblance to the singer in that iconic Irish boy band (sarcasm). However local residents have decided that enough is enough and want to throw their lot in with the Anglican League. 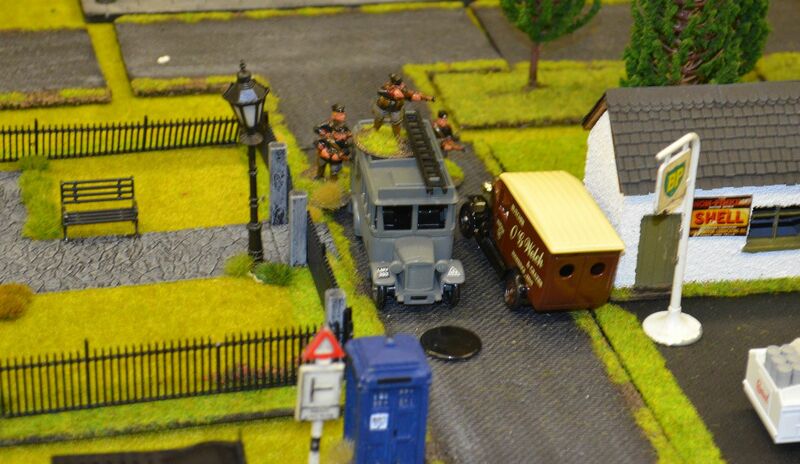 At Dawn an explosion ripped through the telephone exchange and armed partisans can be seen on the streets. As you can see from the table below we had a big table to fight over and just an evening to play it. One of the advantages of umpiring such a game is you can keep the momentum going. 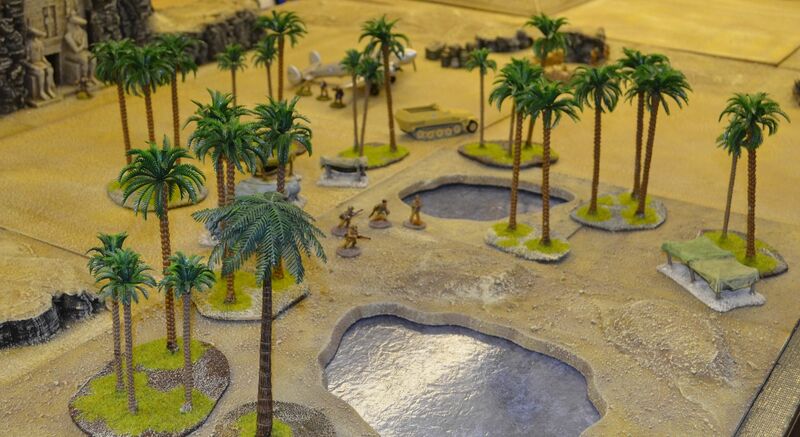 I don't allow players too much time to deliberate their decisions and of course the random activation that Bolt Action brings involves everybody all of the time. In this particular scenario the evil fascist protectorate must put down the local uprising whilst at the same time deal with the amphibious incursion by Anglican League Forces. 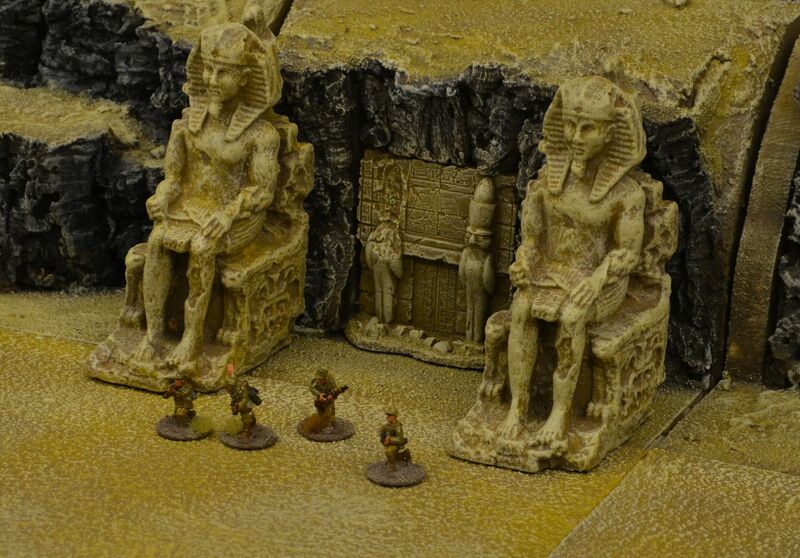 I would estimate that they were outnumbered by a factor of 3/2 in terms of troops and armour. 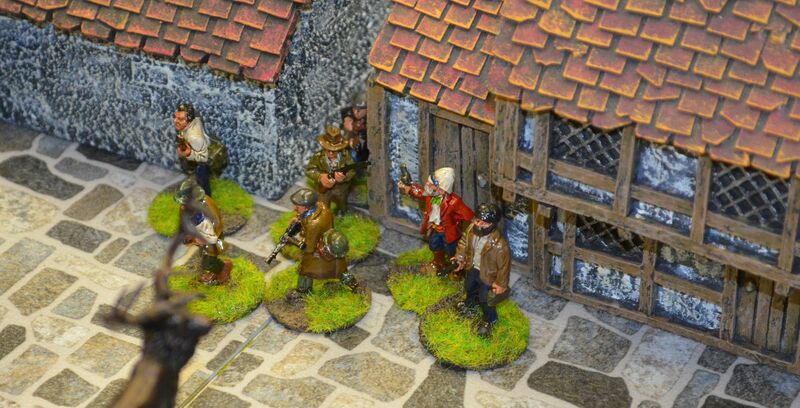 On the BUF side were two new recruits to the shed who I shall refer to as Colonel Steve (commanding the Keep end of town) and Commander Rolf (defending the King George Hotel and the New part of town). Their forces were dispersed according to the map below. Neutralise Partisan threat in the town. 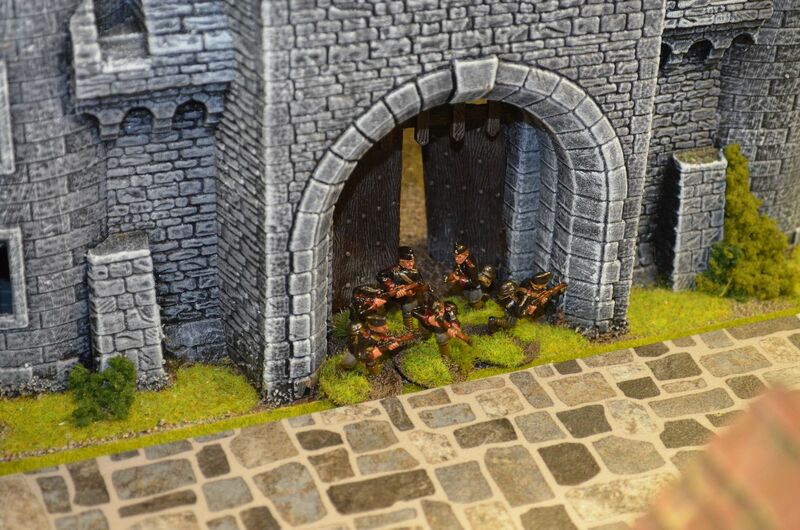 Ensure that key buildings do not fall into enemy hands – The Keep, the Gates, the Rail Station, King George Hotel. At some point in the proceedings you believe League will support the uprising. 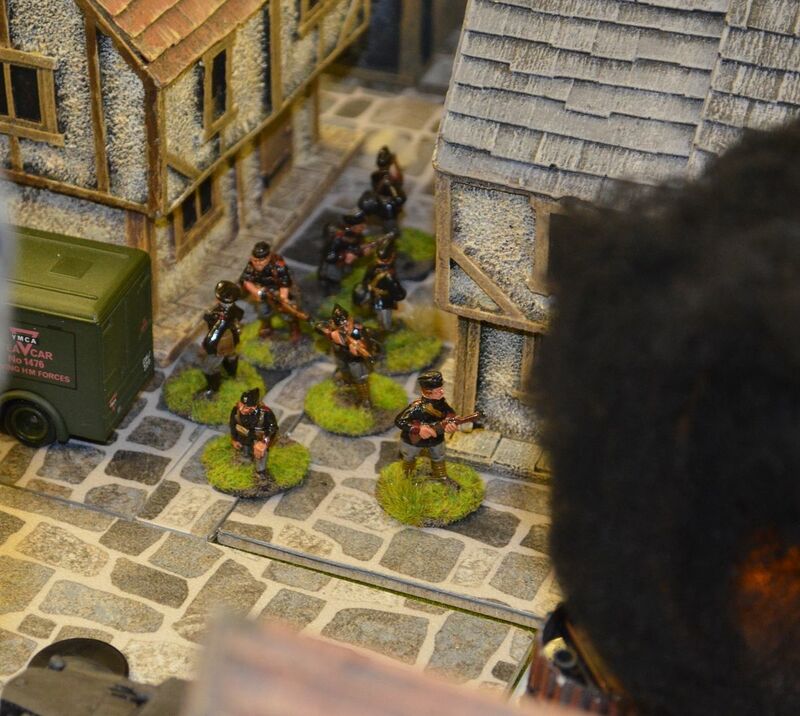 The Partisans were lead by Rebel Leader John 'sticky bomb' Carew with his forces scattered across the table, and the League force were managed by Brigadier Mark Mywords-Down. 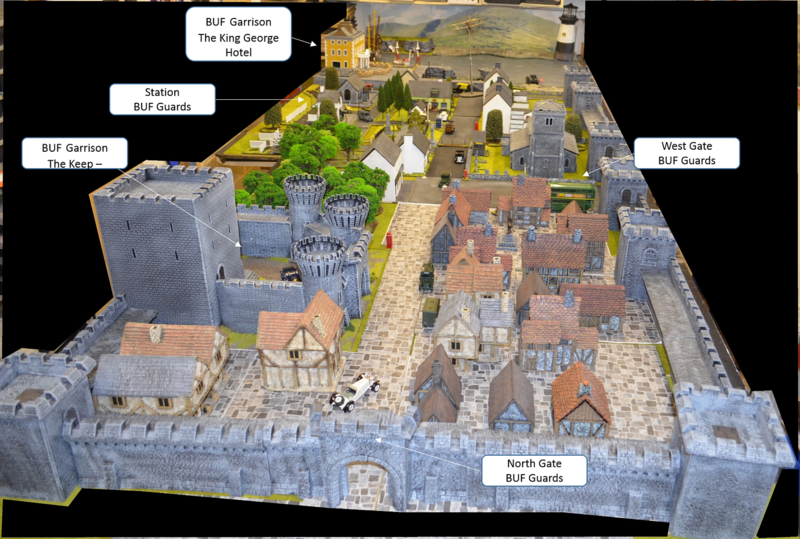 Note: The Heavily defended King George Hotel is not an objective. So with everybody clear on their instructions we kicked off the game around 7.50pm. 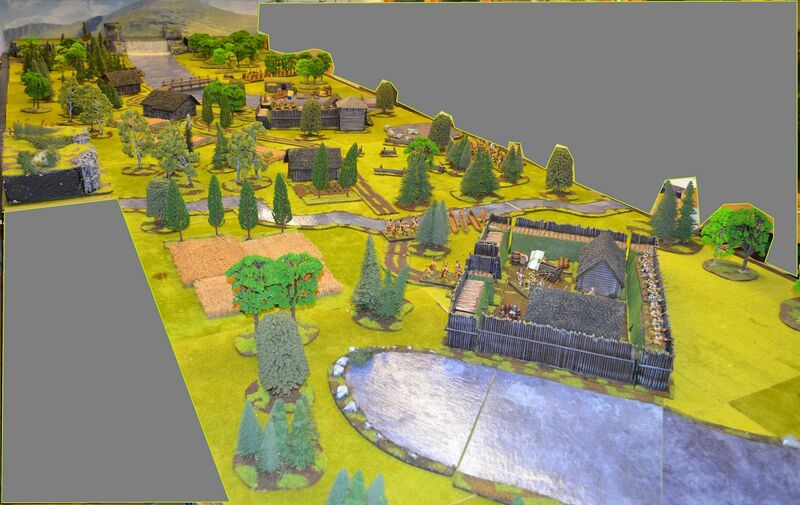 Two and half hours later (about 11 turns) the streets of Southchester had witnessed some of the bloodiest fighting in the war so far. With opposing forces in close proximity it wasn't long before bfighting started. 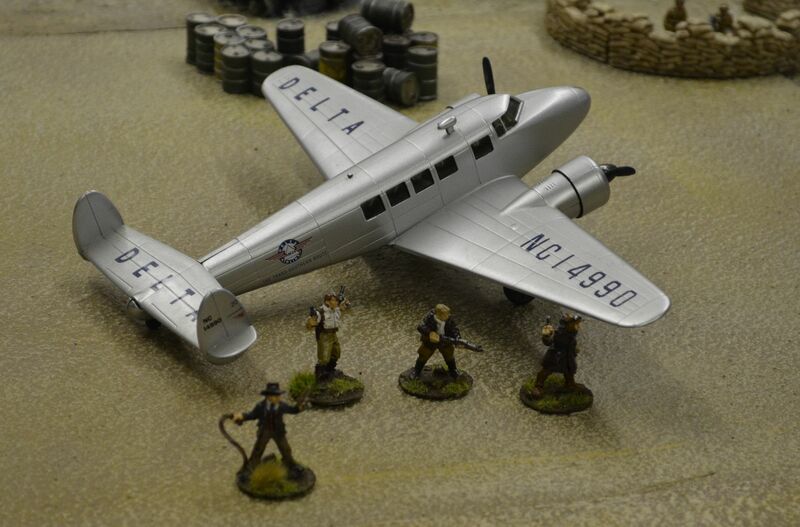 Our first casualty was a body blow to the partisans. Their howitzer armed truck drove straight for the Keeps Gates. (sometimes crazy things work...I thought). 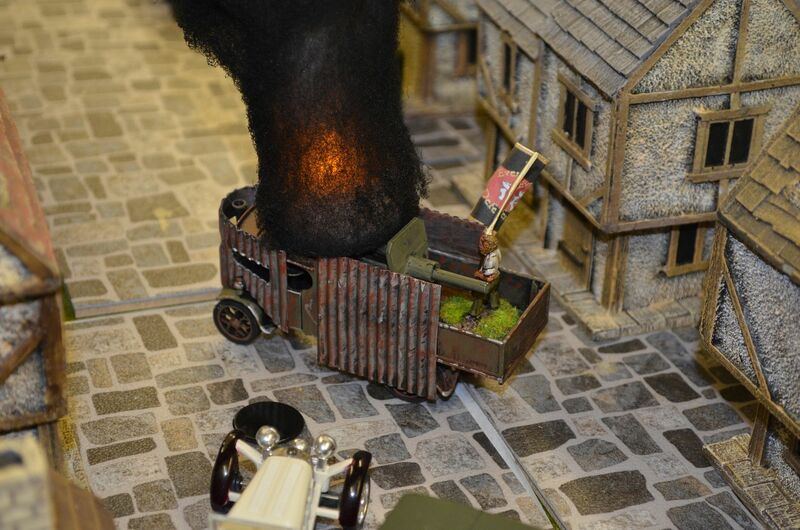 However a rapid burst of HMG fire from the BUF Armoured Car saw the heath robinson styled vehicle explode in a gout of flame. With the loss of his primary weapon Johns rebels stalled their move forward aloowing the initiative to pass to the Keep garrison. 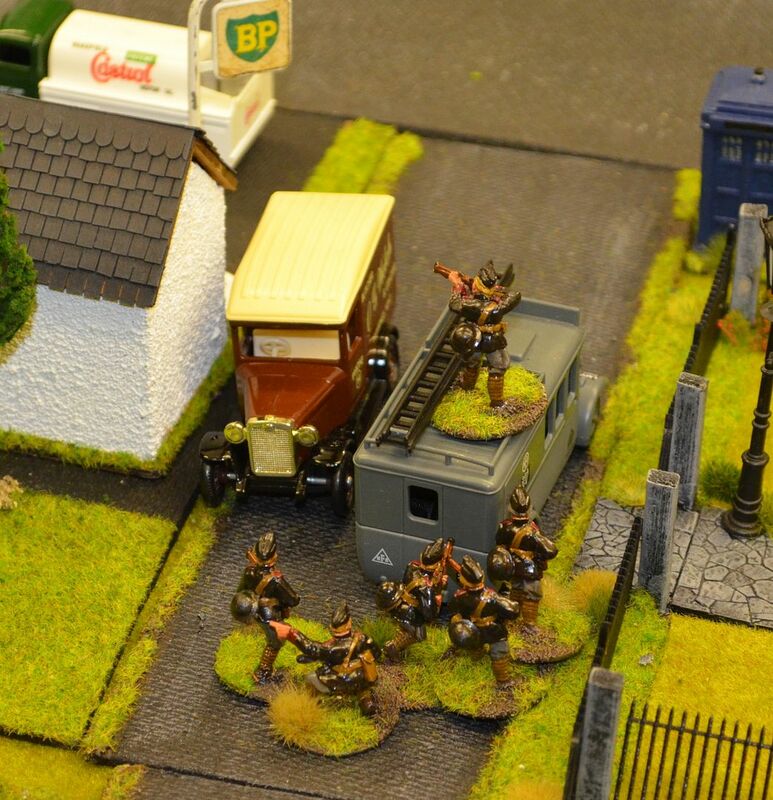 Sensing blood, squads of blackshirts ran into the old quarter to hunt down the partisans. 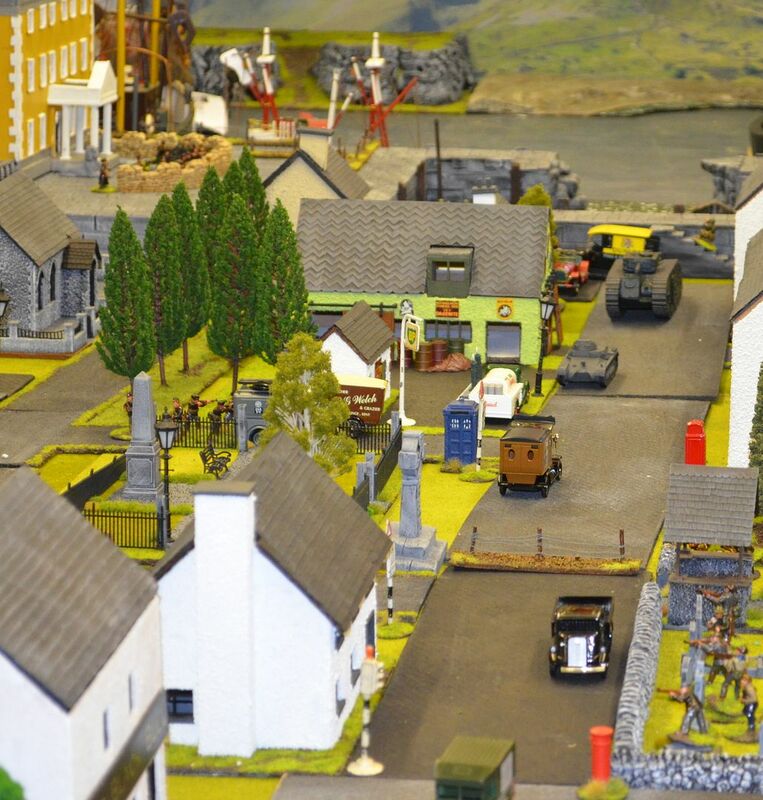 By now Commander Rolf and Brigadier Mark had arrived so we could kick off action down the other end of town. Unfortunately I haven't got round to making landing craft yet so movement trays doubled up. The League moved up onto the beach under a pounding from the Hotel based defenders. Twice Rolf hit Landing craft with careful Mortar fire but casualties were remarkably thin. It looks like the amphibious assault is going to be successful. With observers standing atop the hotel his indirect artillery had a fabulous field of fire but just could not make it count. Recognising that the League forces might get ashore unopposed a squad quickly hijacked a civilian car and drove off down the beach road. The driver then slammed on the brakes did a ninety degree turn and the passengers bailed out behind the ready formed barricade. They then began a furious fire fight with the League troops rushing off the beach. 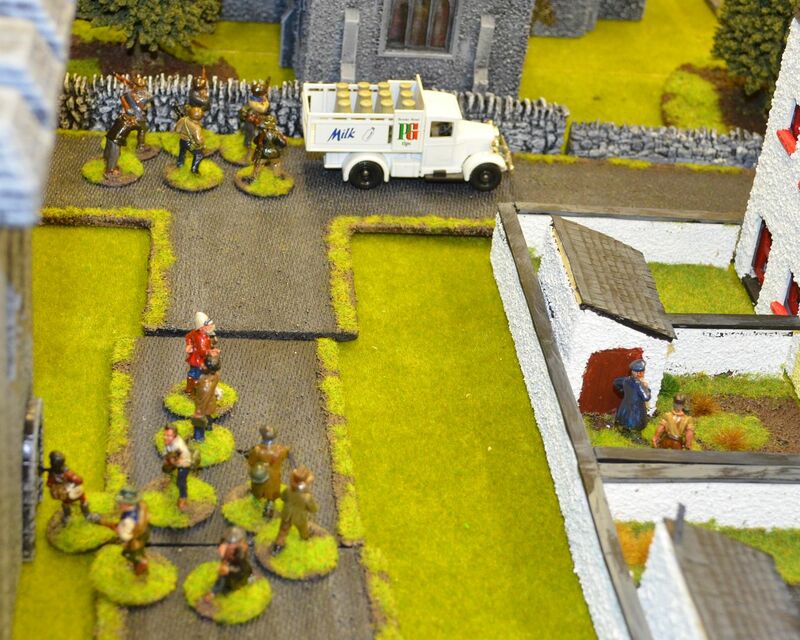 Meanwhilst our Partisans in the Church quarter decided that a supporting operation in the old quarter was required. So they upped sticks and began to march North. 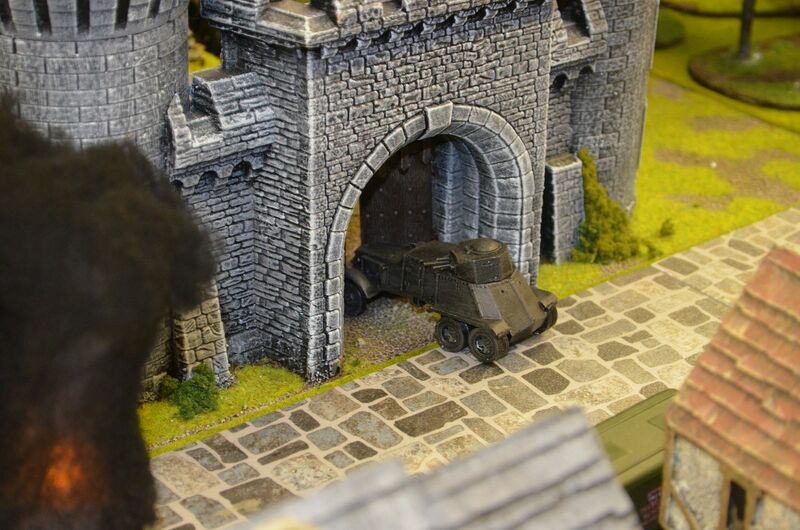 Believing that he had the partisans on the run Commander Rolf ordered his squad guarding the station to hijack yet another vehicle and push forward to catch the retreating partisans. Unbeknownst to him a mortar opened fire a scored a lucky hit pinning the captured van and crew just outside the memorial garden. The Black Smoke of the burning truck hovered across the tiled roofs of the old town, and under covering fire the blackshirts assaulted the first partisan squad in their way. Despite being slightly outnumbered their foolish tactics win them the day. Yet another victory to the 'Lash'. By now the League Armour was on the beach and the big tank made mincemeat of the tank traps. This began to engage fire with the troops holed up in the hotel. All shots from the Big Tank missed - three ones. But Commander Rolf could not even hit this monster. 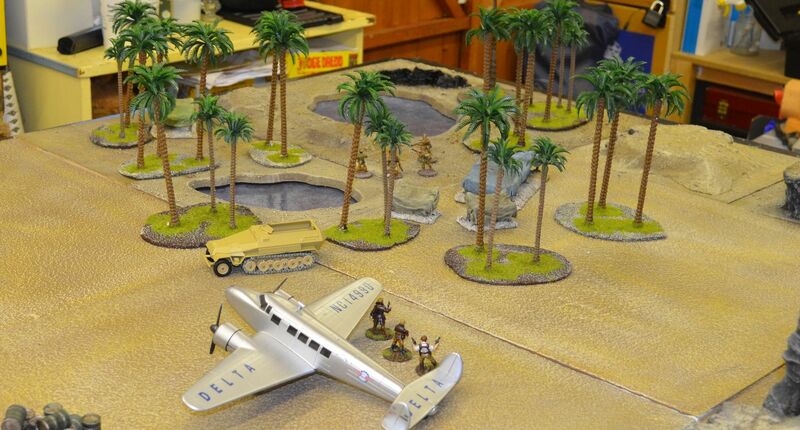 The beachhead was becoming a tale of bad luck for both sides. Remember that truck pinned by the garden...well they failed their activation test so got another mortar round plopped on them. Fortunately no kills but the pins were beginning to build up. In the centre of town the Partisans in the pub had been trading fire with the western gate guard. Once again the Blackshirts were making a better job of it. 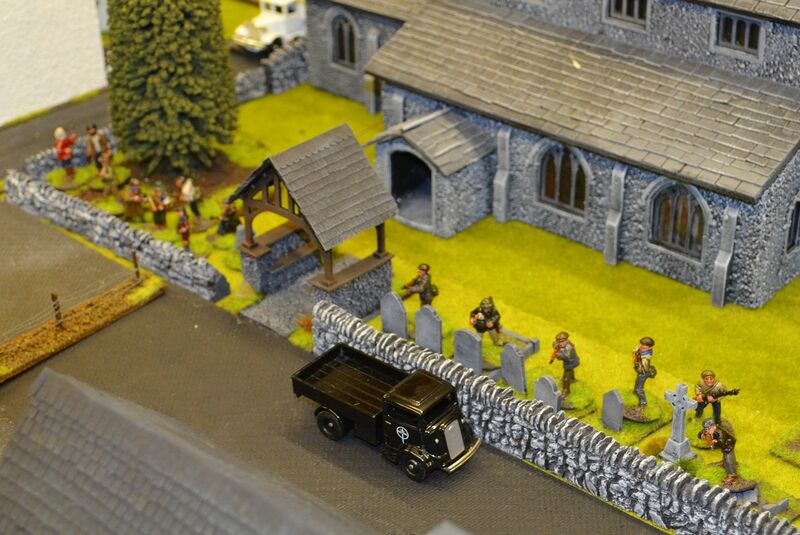 That was until the partisans armoured car trundled into view. Its target the Fascists running amok in the old quarter. Buy now the graveyard previously controlled by the Western Gate Guard (all dead) had been seized by the Partisans. 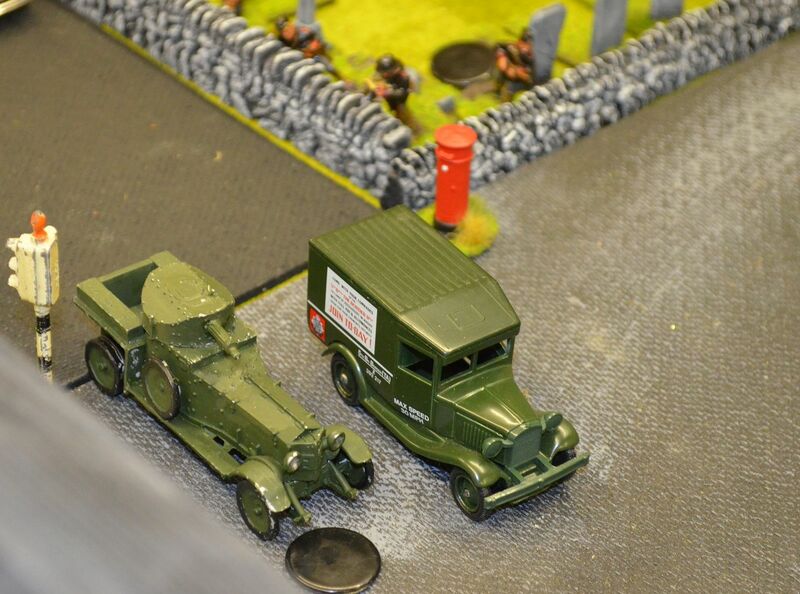 Back to that pinned truck, more mortar fire and the sniper had joined in on the fun. Six pins later the morale of the passengers broke and they routed. Secondary armour support had also arrived. Taking advantage of the gaps made by Big Tank. and onto what is probably the longest protracted tank engagement I have seen in my life. 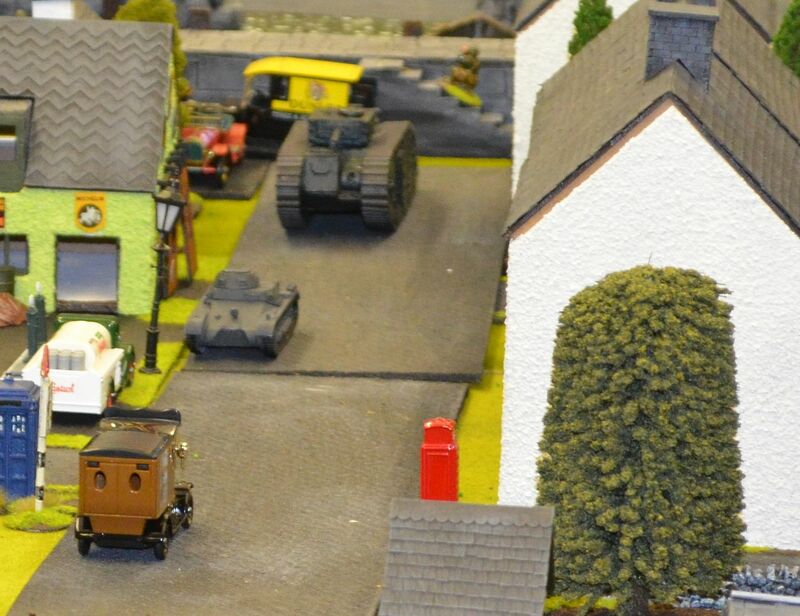 Brigadier MyWords realised that the only thing stopping him from clearing the BUF forces from the southern edge of town was the Panzer MK1. He three everything at it including Big Tank, Little Tank and two infantry squads in close assault. Could he knock it out no...it took three rounds. 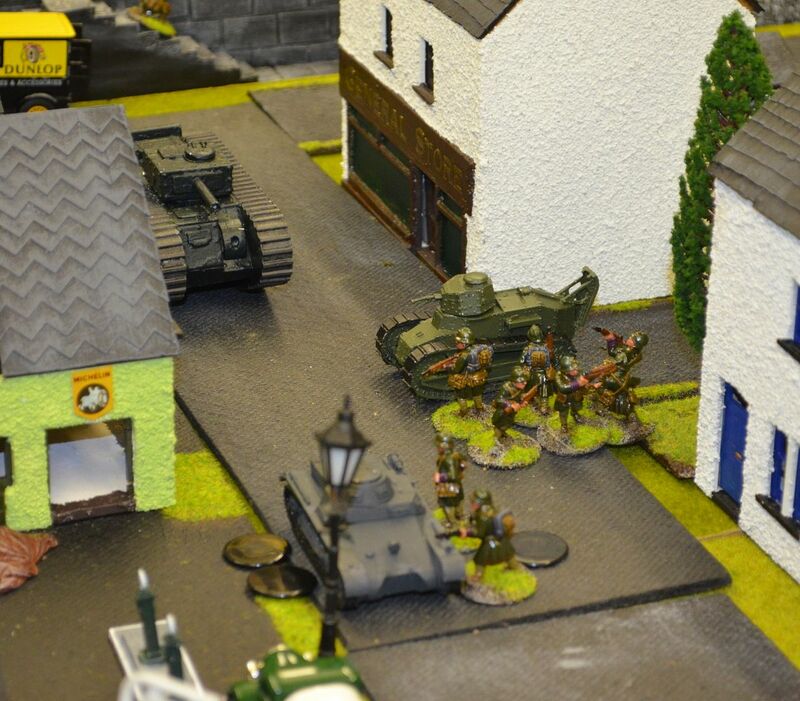 In this time the plucky little Panzer immobilised BIG Tank and shot up both Infantry squads. Eventually Little Tank knock him out. What a furious game...frantic, hectic and certainly could have gone to the wire three quarters of the way in. 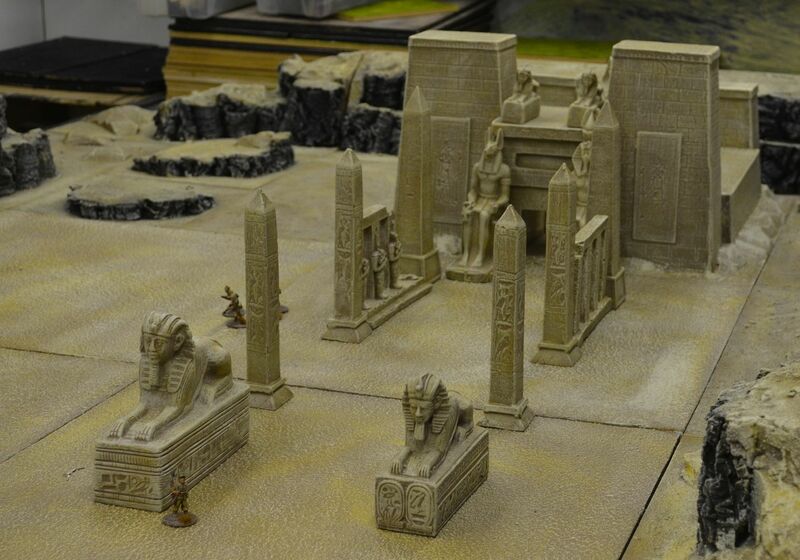 Rocky Escarpments & Pyramid Finished! !